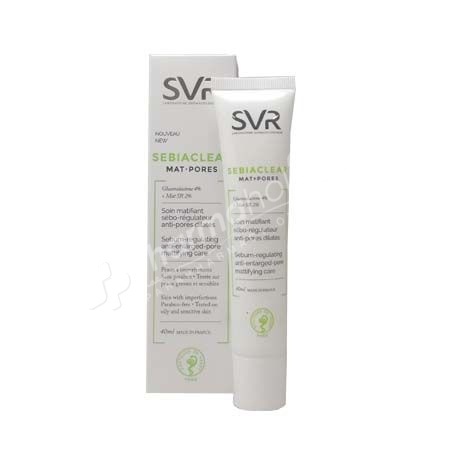 SVR Sebiaclear Mat+Pores 40ml is a sebum-regulating anti-enlarged-pore matifying care. It is specially developed for the skins with imperfections. This anti-shining corrective care acts also as moisturizing and matifying care of long lasting for a efficacy guarantees of 8h. It offers soft peeling with AHA free. It contains Gluconolactone associated to salicylic acid that purify, smooth the skin texture and reduce the imperfections, this a sebo-regulating matifying agent which normalizes the sebum production. It contains also physiologic sugars which allow to moisturize during 72h. Its oil-free fluid texture offers you a mat and velvety finish and constitutes an excellent make-up base. Physiologic pH - Hypoallergenic - Non comedogenic. Apply to the whole face, morning and/or evening.